Savage, Tidying up America. Glass return, Bellagio Casino, Las Vegas. Tidying up America, Glass return, Bellagio Casino, Las Vegas. In the Summer of 2004 I flew to the USA with one sole purpose in mind: to tidy up America. I had just two months for this seemingly impossible task. To ensure my efforts were unbiased I devised a simple system to dictate the direction i travelled: Whenever I found a black glove on the road I would drive in the direction I found it to be pointing. Simple. Having landed in Orlando, and as a result of this strategy, it unsurprisingly took me 4 weeks to get out of Florida. What also became quickly apparent was that America, as far as my glove dictated journey could indicate, was uncannily tidy. It was so tidy in fact that I feared that my efforts were in danger of becoming wholly redundant. Moreover, just outside New Orleans, I got arrested on suspicion of being a terrorist. It was post 9/11 and I had been seen taking a photograph of a black glove on the road. First on the scene were security, then blue and whites, then suits. They all ransacked my rental car and repeatedly asked the same question: 'What were you photographing?' to which I repeatedly replied 'the glove on the road'. I tried cheerfully explaining to them that I was driving around America with my journey dictated by the direction in which I found black gloves to be pointing. Even as the words left my mouth I already knew that saying it was going to do anything but help resolve the situation. They seemed convinced I was reconnaissance for some terror plot - the road, as it transpired, happened to be outside a nuclear power station - yet, eventually, some three hours later, they came to realise that I really was just a somewhat harmless British weirdo and they let me on my way. Not however without them generously advising me of my apparent need of a bath. Fear of rendition stopped me from suggesting that they in turn could do with getting a sense of bloody humour. It was finally on arrival in Las Vegas that an opportunity presented itself. Walking around Vegas you can very easily get on to a cleverly designed circuit which takes you from Casino to Casino. 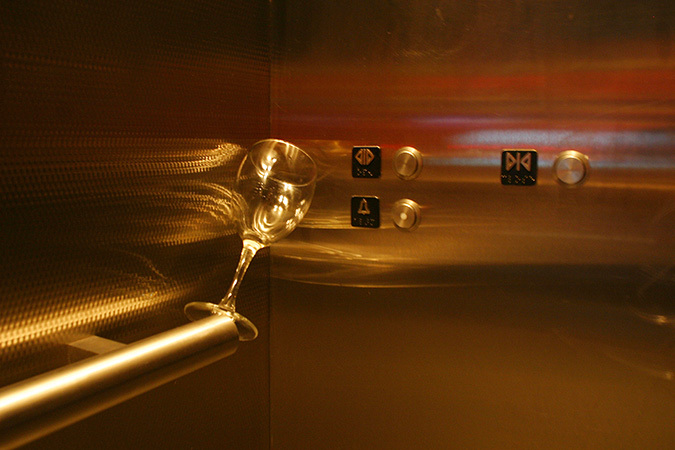 It was in the elevator taking me from the street to the famous Bellagio that I discovered an abandoned empty wine glass left leaning on the hand rail. It contained the remains of some red wine and was marked with pink lipstick on its edge. I picked it up and quickly took it back to the Luxor, where I was staying. There I washed and polished the glass before returning to the Bellagio lift an hour later to place it back exactly where I had found it. I had finally begun to tidy up America.